Every good strategic marketing plan includes two elements: strategic direction and plans for moving the company in the new direction. After you have developed your strategic marketing direction, it's time to develop strategies for each of your major marketing functions. Unfortunately, many companies can't seem to convert their marketing strategy into the marketing plans that guide their day-to-day marketing programs. You've probably seen companies where the advertising didn't match the actual customer experience at the point of sale. This occurs when the manager of each marketing function does their own thing instead of aligning with the company's strategic marketing direction. Either the company didn't have a strategic marketing plan, or senior management didn't use the plan to guide their marketing program managers. Whatever the cause, the "silo" effect occurs, keeping the marketing managers from working together harmoniously, like a concert orchestra. Instead of keeping the marketing strategy safely hidden away, I like to integrate the strategic marketing direction into the marketing communications strategy, sales strategy, and other marketing functions. This unified approach to developing a company's strategic marketing plan makes it easy for the managers to align their marketing activities with all the other marketing programs. In other words, this alignment helps ensure that the strategic marketing plan is actually used to guide the day-to-day marketing programs, such as advertising, public relations, social media, and sales. Everyone within the company who comes in contact with customers is part of the marketing function, even if they don't report up to the company's chief marketing officer. Every marketing program needs to present a clear, consistent message that's in harmony with all the other marketing programs. Part of this "best practices" approach to achieving harmony is to develop an internal communications process that ensures that everyone knows their role in communicating with potential customers. I find it helpful to use a marketing strategy mind map to capture ideas, plans, and relationships so I can present them in review meetings. 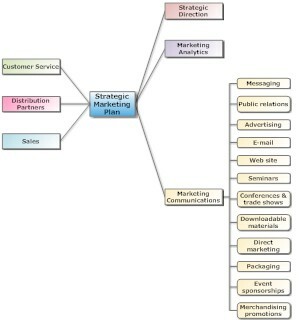 The marketing strategy mind map can also be used in briefings and brainstorming with your advertising agency, public relations firm, call center, distribution center, and other vendors that affect your customers' experience. During planning meetings, such as for marketing communications, I encourage brainstorming of all the techniques that the team feels could support the overall strategy, which we add to the mind map. For example, some companies consider the lead nurturing program to be part of marketing communications until the lead is contacted by a salesperson. However, other companies feel all communication with leads should be handled by the sales department. Another benefit of using mind map software is that during a review meeting you can focus attention on high level strategies. Then, click an area to "unfold" the diagram to reveal program details and show relationships. Sharing the mind map within the marketing organization keeps everyone up to date on the company's marketing strategy and implementation plans. Exactly how you distribute mind maps will depend on how your marketing organization is connected. Centralized marketing teams are on the same local area network and file server, while others are distributed across multiple locations and collaborate using the Internet. After your marketing strategy mind map is made available, expect that program managers will want to develop their own mind map to manage their operation. Most mind mapping software allows you to link to Web pages or local documents (such as other mind maps). This makes it easy to link from the main marketing strategy mind map to each program's own mind map to see their detailed plans, projects, and tasks. Some mind mapping software products have extensive budgeting and project management features, while others have little or no project management capabilities. Be sure to select a mind mapping product that you can grow into over the next few years. This unified approach to marketing strategy and program plans can help your marketing team avoid the "silo" problem that affects so many marketing organizations. When your marketing program managers understand how all marketing programs are implementing the strategic direction, they can align their marketing activities to create a consistent customer experience. And at the best possible cost.